An old automated Cardassian security program is tripped, threatening the lives of everybody aboard the station. When O'Brien starts talking about how hellish it must have been to be an ore processor on Terok Nor, perhaps he is channeling his alternate reality self from "Crossover." 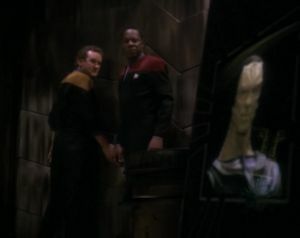 After "level three" is triggered, Garak announces that the only person who can stop the program is Gul Dukat, but the automated message just suggested the probability that Dukat has been killed in an insurrection. Interesting relationship between Dukat and Garak. I love the bit when Dukat tries to beam away and triggers yet another part of the security program. That's pretty clever. The uridium explosion is lame. When Sisko, Jake, and O'Brien are moving to deal with the imminent self-destruct sequence, why aren't they running? What happened with Dukat? We are given no closure to the situation in Ops, as if the writers simply forgot about it. This isn't a bad episode by any stretch, but it feels like it's just going through the motions. The entire screenplay could have been tweaked from TNG's "Disaster," but it lacks the emotional punch of that episode. It has the potential to be as memorable, but none of the situations are as good as Troi's sudden command, Worf having to deliver Keiko's baby, or Picard having to deal with children. The best situation here is Odo and Quark being stuck together, but that never really goes anywhere.